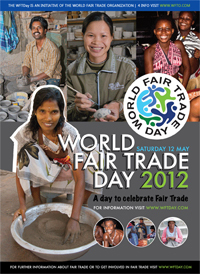 FairMail - Blog - 12 May: World Fair Trade Day! This Saturday the 12th of May Fair Trade will be celebrated in many places and cultures across the globe during World Fair Trade Day. Various events are organized in more than 70 countries in Africa, Asia, Europe, Latin America, North America and Pacific Rim. Leading the celebration are members of the World Fair Trade Organizations (WFTO) that have pioneered Fair Trade for more than five decades. As a WFTO member for more then two years FairMail is celebrating World Fair Trade Day at the “Levenskunst Beurs in Vught“. FairMail will be setting up a photo exhibition with pictures from our teenage photographers, show videos and sell the new card collection. So please come and have a look and celebrate with us! Also we are offering a 10% discount on the entire FairMail collection in the FairMail webshop. At the end just add the discountcode WFTD2012.